Summer is far from over. You still have plenty of time to spruce up your backyard. Specifically, you still have time to add value, aesthetic appeal, and functionality to your backyard and swimming pool area with one simple project – a Low Maintenance Pool Deck! A low maintenance pool deck combines the best of both worlds, composite and natural wood. 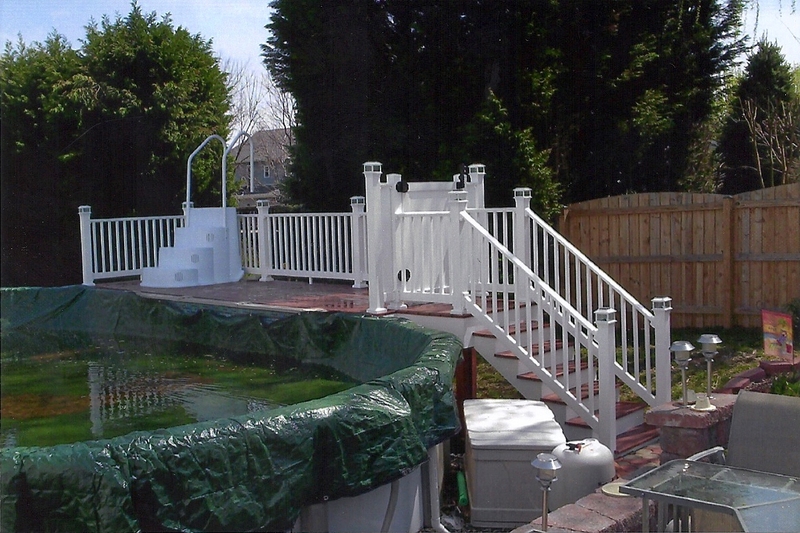 While the deck frame is still constructed with pressure treated lumber, the flooring and railings are PVC or vinyl. This provides an aesthetically appealing look that requires considerably less maintenance than a wooden pool deck. Low Maintenance: Not only are PVC and vinyl easy to clean, but they do not require staining and sealing, either. Please take a moment to browse Freedom Fence & Home’s gallery of wood decks and low maintenance decks (click on any image to enlarge). This entry was posted on Wednesday, July 11th, 2012	at 7:55 pm	. Both comments and pings are currently closed.